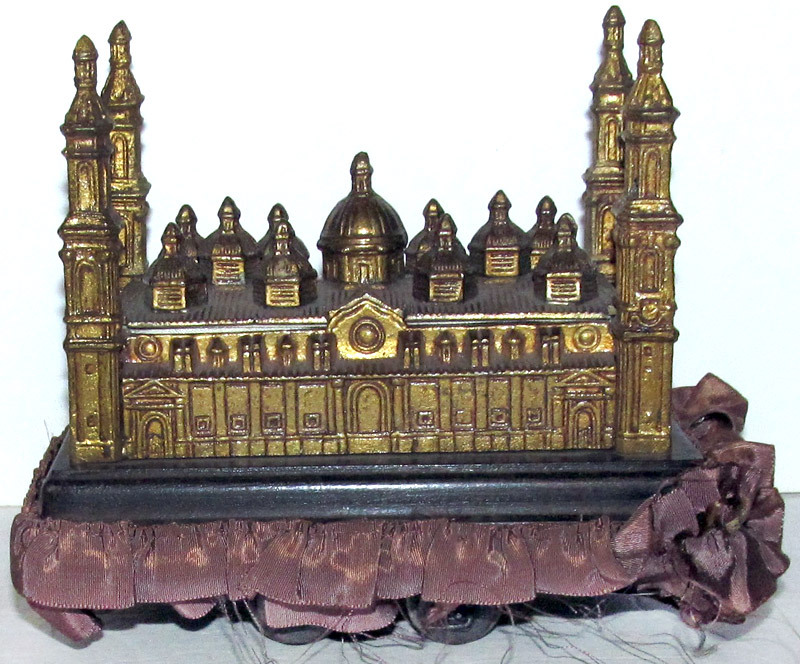 This unusual antique jewelry box or casket is in the shape of the Basilica in Zaragoza, Spain. Not only is it a rare souvenir building that is not in the Monumental Miniatures book, but it has an unusual feature - It’s on wheels. Hiding under a now-frayed purple satin skirt, the wheels appear to be similar to those of a old model train. Anyone have an idea of what the purpose of the wheels could be? 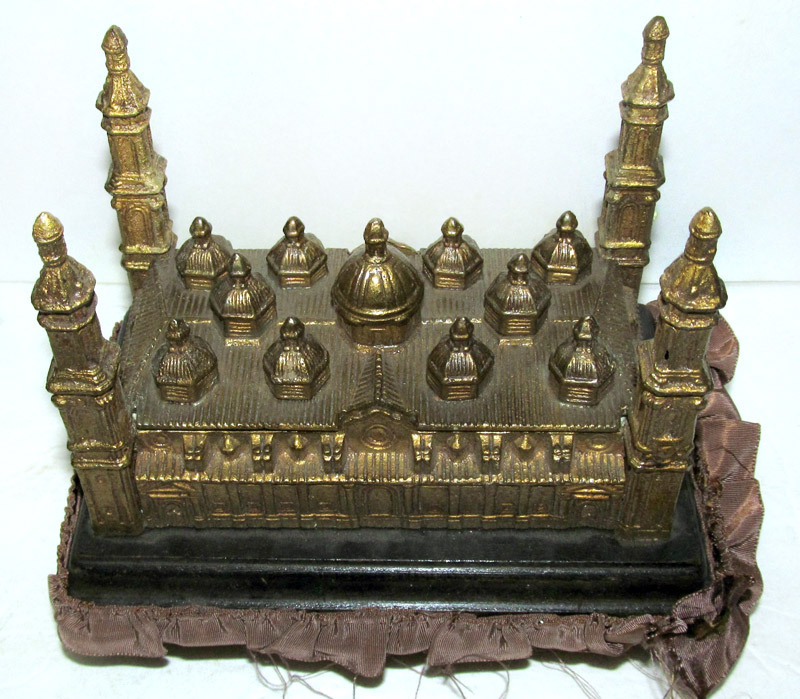 The miniature metal building replica measures approximately 5-7/8" high by 6-1/2" by 4". It sold recently on eBay for $270. The seller included a paper that was inside the box on which was written, “Maqueta Del Farol Que Representa El Templo Del Pilar.” Which in Spanish means: Scale Model of Lighthouse Temple Del Pilar. The real Basílica de Nuestra Señora del Pilar (simply know as El Pilar) s an important pilgrimage site, thanks to an ancient pillar said to have been given by the Virgin Mary to Saint James at this location. Build in the 16th- and 17th-century, the basilica El Pilar dominats the Zaragoza skyline from its riverside location. Its exterior has a mosque-like style with a large rectangular floor plan and tall corner towers. Each year for 9 days, the Fiestas del Pilar honors Zaragoza's patron saint, the Virgin of the Pillar. Could the wheels be related to the festival? 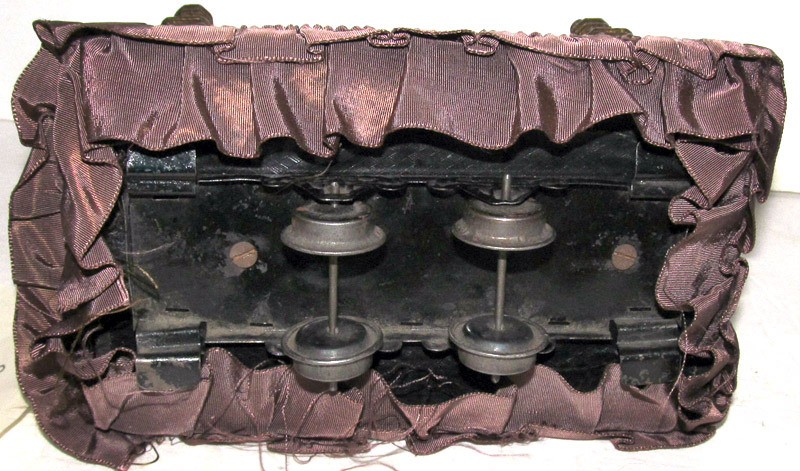 If you have any information about the wheels, help us solve this mystery and share your ideas with us via the comments link below.